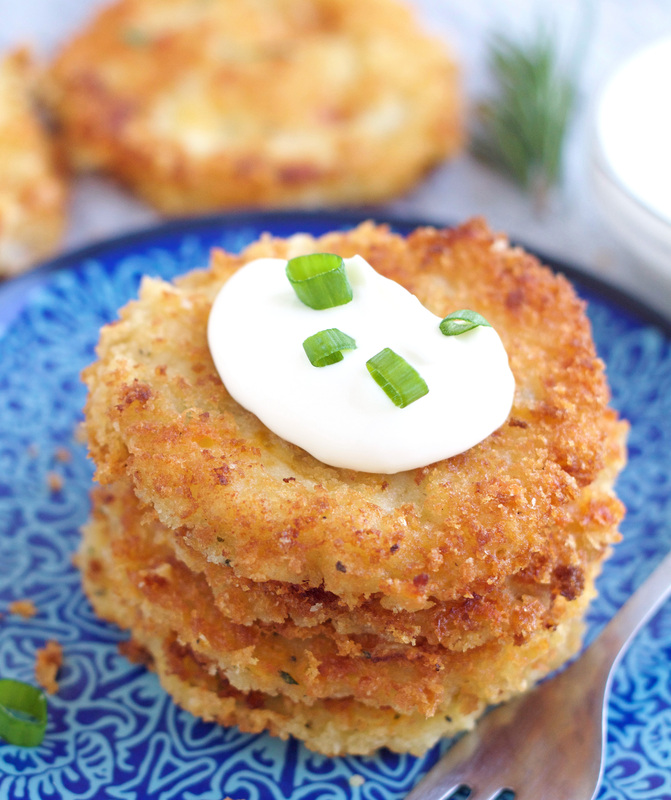 These Cheesy Potato Pancakes are crispy, cheesy and crazy good. They’re so simple to make and the perfect side dish for any meal. Side dishes . . . sometimes they get the best of me. There are nights when my boys are lucky enough to get a “real” side dish, and other nights it’s apple slices or carrots sticks & ranch dressing. Are any of you in the same boat? If you are, then today I’ve got something that will hopefully help you out. These Cheesy Potato Pancakes are amazing and a simple, fantastic side dish to go along with any meal. These pancakes are a great way to use up leftover mashed potatoes, but if you don’t have any, they’re absolutely worth making mashed potatoes for. What’s not to love about cheesy, hot, crispy, potato pancakes topped dipped in ranch dressing or topped with sour cream? They’re a side dish lovers dream come true. Seriously these are so dang good and really versatile. You can swap out the kind of cheese you use and add any seasonings you’d like. My boys can’t get enough of these. You’ll love these, I promise! One more thing, I’m in the process of converting my recipes over using a new recipe plugins, so you may see some of my recipes a different format while others still look the same, I’m hoping to get it done quickly and without too many issues. Be patient and if you see a recipe that looks really strange, let me know. Thanks for your patience. In a large pot, boil the potatoes until they're fork tender. Drain well and mash with a little butter and a little milk. Season with salt and pepper to taste. (**You want the potatoes to be on the "drier" side, you don't want them to be super creamy). Let them cool a bit. Use a large ice cream scoop, evenly scoop balls of the potato mixture and place on wax paper. Gently flatten each mound with your palm into thick patty (about 1/3 - 1/2"). Dip both sides of the pancake in bread crumbs and set back on wax paper. Repeat with remaining pancakes. Heat a large non-stick skillet over medium heat with enough oil to lightly cover the bottom of the pan. Add patties in a single layer and cook 3-4 minutes per side or until golden brown. Repeat with remaining patties, adding more oil as needed. (I use two skillets so it goes faster, don't over crowd the pan). Transfer pancakes to a cookie sheet lined with a brown paper bag or paper towels. 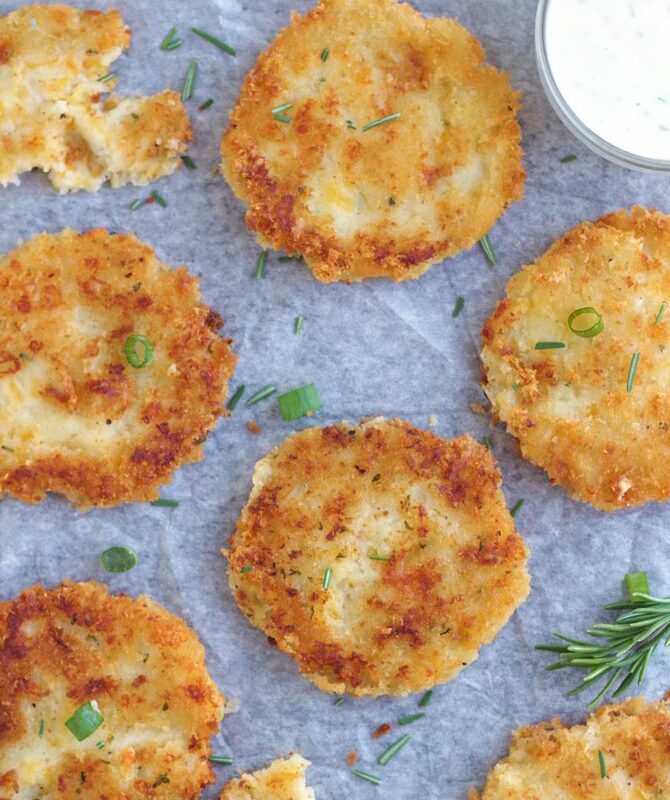 If you have leftover mashed potatoes, those work great for this. You'll need 4 cups. If you're not a fan of rosemary, you can use chives, green onions or any other herb you'd like, or just leave it out. To make these gluten free, you can crush up Rice Chex and use that in place of the bread crumbs.